Type of a Business roof is constrained first by the roof’s slope, special needs of the business, owners budget and desires, regulations and time constraints. When you contact us for a free consult, we'll go through all the roofing possibilities available, explain pros and cons and encourage any questions or concerns. Business Roofing material for moderate to steep pitched roofs are, asphalt shingle, clay tile, concrete tile, metal and slate. Asphalt shingle being the most affordable to slate the most expensive. If speed of installation is a big concern, metal panel roofing would be the quickest install. Business roofing for flat (nearly flat) will use Metal panels, TPO (single-ply membrane), Rubber Membrane (EDPM), BUR (Built Up Roofing), Modified Bitumen and Liquid Polyurea Waterproof coatings. Flat roofing membranes have improved over the decades since inception into stronger materials that resist damaging sunlight, algae, splits in membrane and punctures. Also, they have better ability to breath with the building during weather shifts. We are a local, experienced and affordable commercial roofing contracting team that is eager to gain your trust by sending superior consultants to evaluate the repair, replacement or new build of any type of commercial roof. Our advice is free and gladly given. Flat roofs are the most cost-effective roofing for large commercial buildings. It is feasible to put a sloped roof on a small building because the slope of the roof will be reasonably small to be ascetically appealing and structurally sound. However, on a very large building you would have to have a very tall (100’s of feet) steeple like roof to be somewhat structurally sound, but the huge amount of weight required for such a roof would cause it to sheer off in a breeze. Just the difference in the amount of building materials required for such a high roof would be beyond compare. Flat roofing types are: BUR (built up roofing or tar and gravel), Modified Bitumen, Rubber Membrane (EDPM) Metal Panels, TPO (single-ply membrane) and Polyurea Waterproof coatings that are sprayed over roof decking or to restore older roofing. Skill in repairing or installing all types of flat roofing is just as important as the material of choice or roof type. Careless roofers that do not strictly follow industries protocols and regulations will install a roof doomed to fail early. Warranties of materials and roofing contractor are both very important. An honest Roofing Contractor, should be more than willing to stand behind their crews’ work for several years. 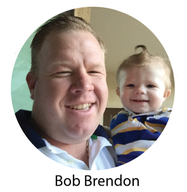 We offer FREE one of the best warranties available: 7 years no-worry labor guarantee- many of our competitors charge for labor guarantees. Industrial roofing implies some type of manufacturing which often requires robust roofing materials that will withstand increased heat output through chimneys, air exchanges for safe welding or product ovens, filters for gasses released from adhesives or for byproduct vapors from chemical reactions. 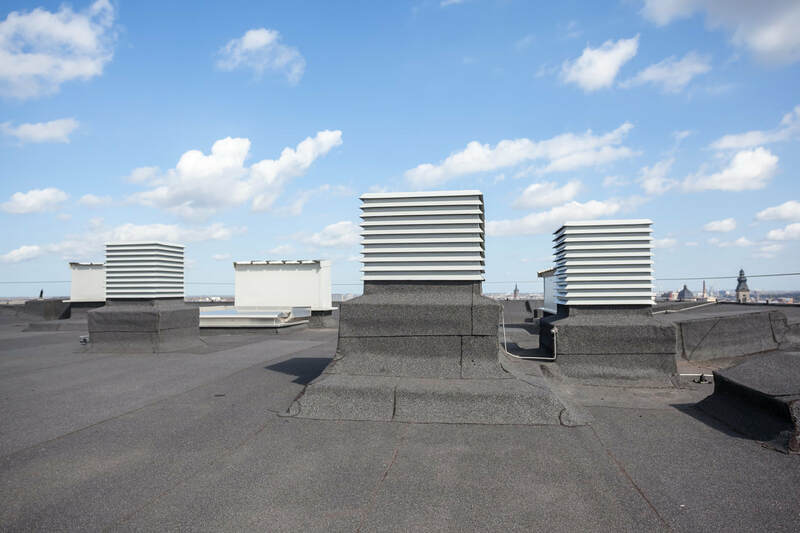 Industrial roofs need structure support that will allow the easy access to servicing personal for all environmental equipment located on the rooftop. Some roofs are designed with walkways on the rooftop to direct its foot traffic. They also need a drainage system that will handle heavy downpours for a large open space- sending the water quickly off the roof. The type of roofing that works well for industrial roofs are flat roof systems, such as Tar and Gravel (BUR), Modified Bitumen, TPO single-ply membrane and EDPM rubber membrane roofing. Asphalt, also known as bitumen, is a thick, sticky and very viscous liquid form of petroleum. It is produced as a byproduct of the oil refinery process and it also occurs naturally in seeps, such as in La Brea Tar Pits and in the Dead Sea. People first used it as a cement between building materials or as a waterproofing agent to caulk canoes and seal baskets. Asphalt shingles are made from a fiberglass matt that is saturated with asphalt then topped with a coating of ceramic granules. Ceramic granules give the shingle its color and protection against impacts and ultra-violet light. 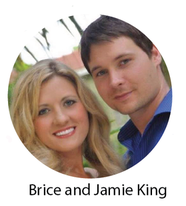 There are basically 3 types offered from the least costly 3-Tab shingle to the costlier Dimensional shingle and finally, the even more costly, Premium shingle. We only use High Quality Material, such as brands like Tamko, Owens Corning and GAF all of these manufactures have many factories throughout the states and have demonstrated quality products with real world testing. We buy the entire set of shingles needed from the same place making sure it’s the same batch so our roofs don’t look patchy. Dealing with reliable and reputable roofing material sources, along with a high-quality installation allows us to offer exceptional warranties: We back 100% the corrections of any errors in workmanship for period of 7 years (more than enough time for any installation faults to show up). Most metal roofing used on commercial business roofs are in the form of panels. 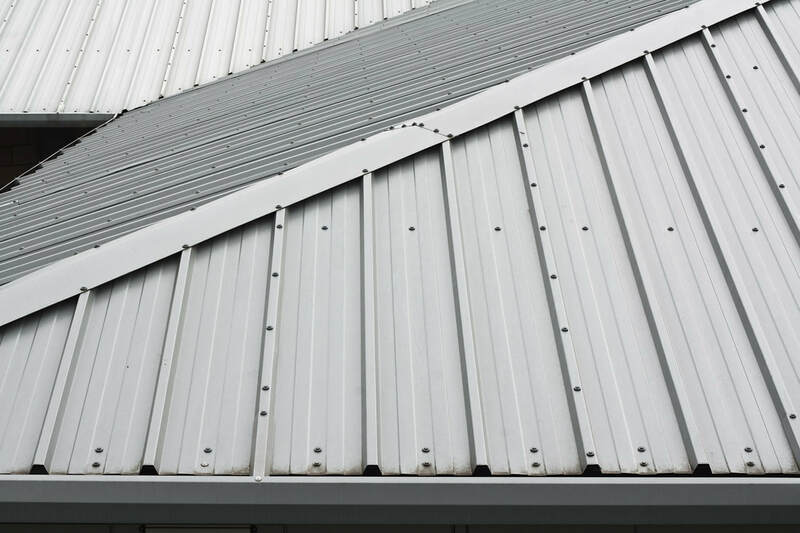 Metal panels are quickly installed, provides a strong protection against high winds and sheds snow easily (metal has a slippery surface). Also, Metal is resistant to fire, mildew, insects and decay caused by fungi. For gentle to high slope commercial roofs, metal roofing is low in maintenance and has increased lifespan over most asphalt shingle products. 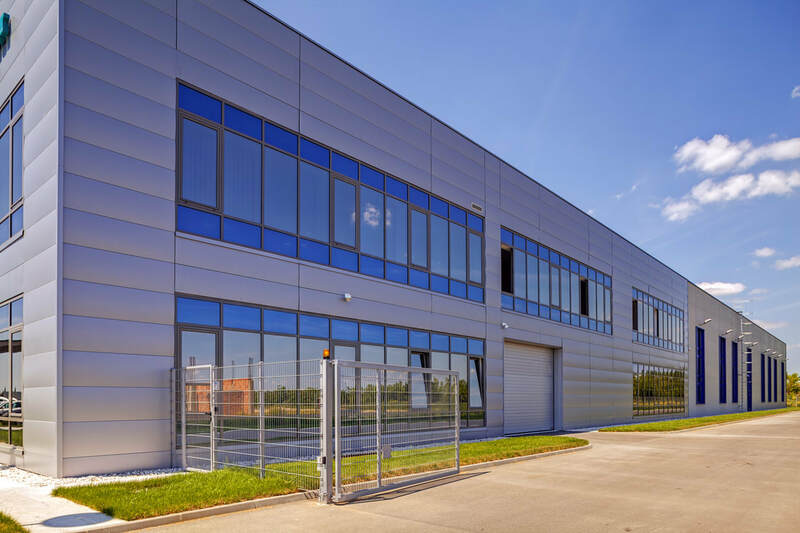 The range of colors and styles available in metal offers the ability for customers to customize the design of their buildings to enhance its aesthetic appeal. Aluminum, steel, copper and zinc are the most common types of metal shingles. Also, they have a wide price range with copper and zinc being on the high end mostly they are 2 to 5 times more expensive than and asphalt roof. Metal roofs require specialized skills and equipment to install correctly. Careless roofers or those without the proper tools may damage the metal panels during installation which could shorten the roofs lifespan. Life expectancy is 40 to 70 years depending on type and skill of installation. Slate roofing goes back a long time in the history of roofing materials. 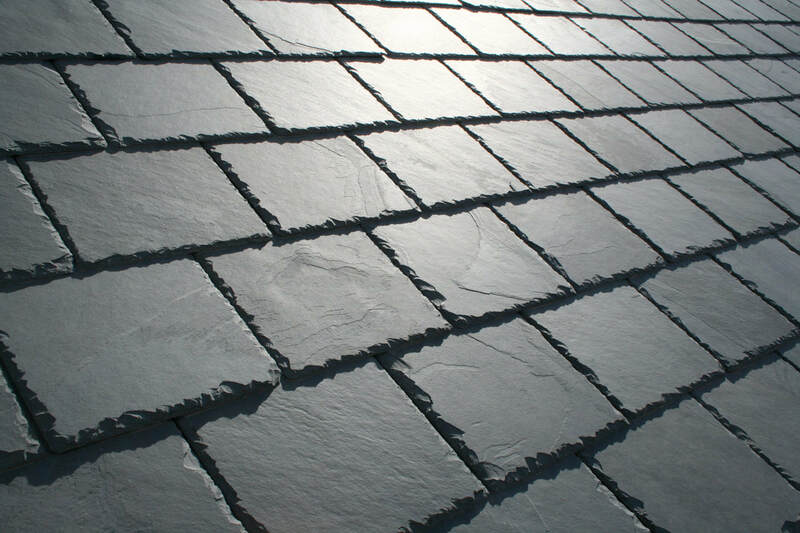 Slate was first used in North Wales, England during the early 14th century. In America slate roofs first appeared in the 1600s and the first quarry did not open till 1785. Due to the fragile nature of slate during transportation, it was mostly used on homes closer to the quarries. Transportation has much improved since then however breakage still occurs so a certain overage will be added to the slate order. Appearance of a slate roof is unmatched. It is quarried in colors of gray, green, purple, black, red and mottled tiles that swirl with several colors mixed in. Its longevity, sometimes beyond 70 years, is famous throughout the USA. Price, is often out of reach for most homeowners but businesses have deeper pockets and consider its beautiful appearance and longevity worth the extra outlay. Slate Roofing often gets installed incorrectly: Roofers will kneel or walk on the slate tiles causing fractures in the piece that may show up right away or years later. The tiles have to be positioned in a certain width of overlapping the last tile to be waterproof. Often a roofer will have to drill the individual tiles with a nail hole for attachment. All materials that surround or support the slate roof also has to be of a premium nature to last as long as the slate roof. TPO was introduced to the market in the early 1990s as a less costly membrane as compared to a PVC membrane but with the same advantages, such as hot weldable seams, energy efficiency and ease of installation. TPO membranes are extremely durable. 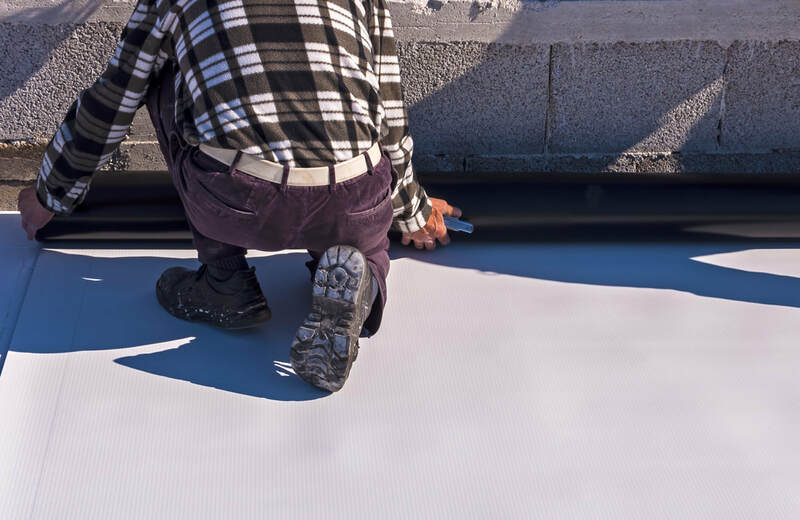 TPO membrane resists punctures, mold, dirt accumulation and is flexible to allow for a building’s thermal expansion and contraction as the climate changes. 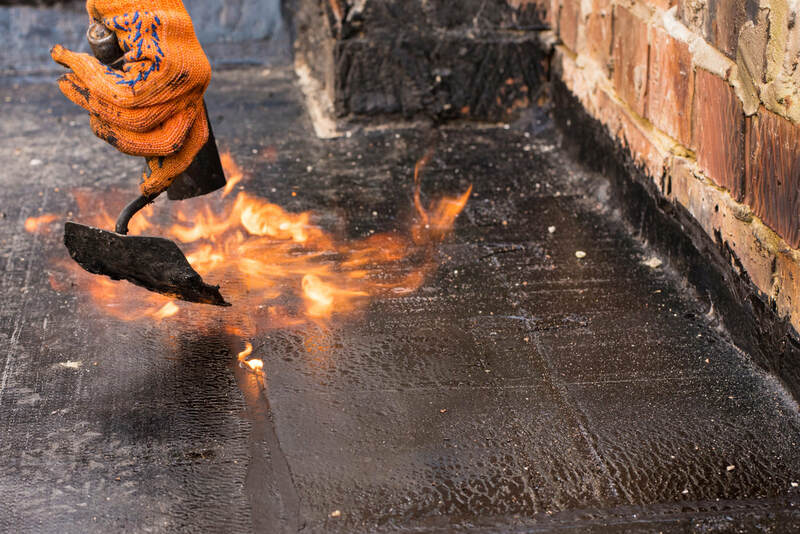 Modified Bitumen Roofing system is akin to the BUR system except instead of the felt layer being mopped with hot bitumen it already has a bitumen infused membrane that is applied with a torch down method. Torch down method uses a propane torch to heat up the infused asphalt in the membrane and attach it to the roof deck. The membranes are also torched down to each other in their run across the roof in overlapping seams. Modified bitumen membranes are a mix of asphalt and rubber with a mineral layer embedded on the top of the membrane so a gravel top is not required. However, it may be used as a ballast to weigh the membrane down against wind uplifts. Polyurea is a liquid coating sprayed on roofs that will protect them with a strong flexible waterproof monolithic membrane (No Seams) Different manufacturers plan their formulation to carry a wide range of features to fit a variety of situations. 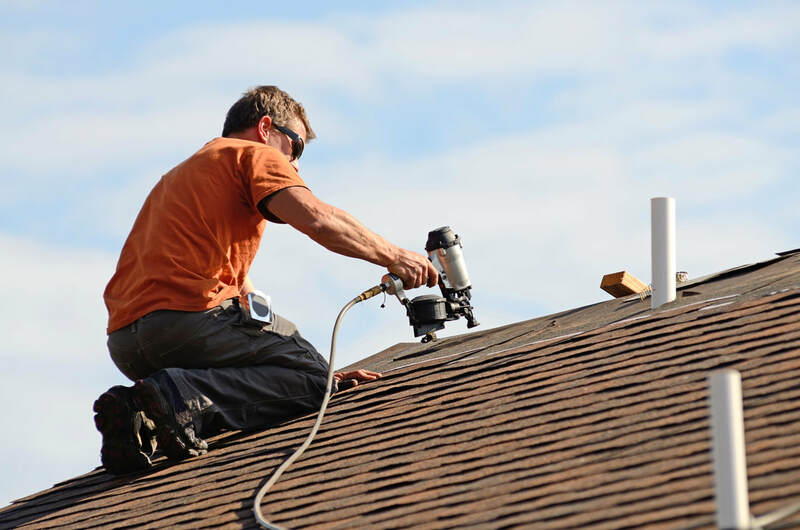 As your commercial roofer, we can advise which are best suited for your specific needs and Fairfax city’s climate challenges. 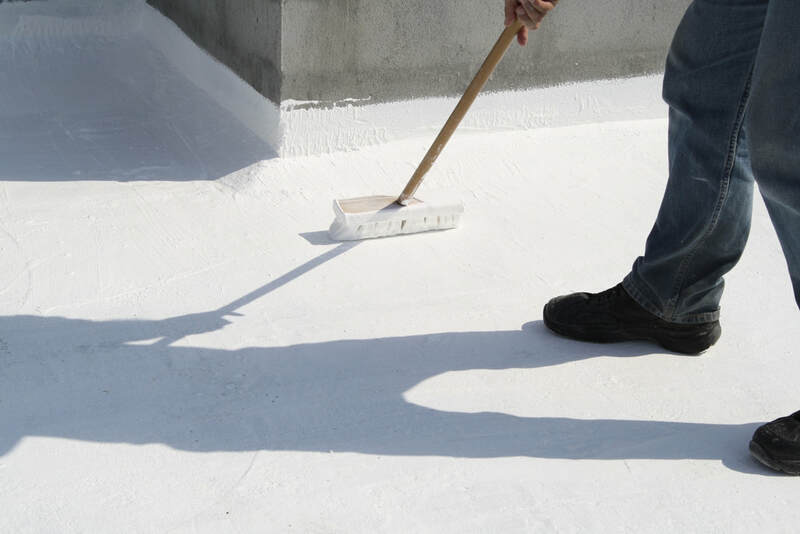 Polyurea waterproofing is applied to older and failing flat roofing systems and it can be applied over most types of roofing systems including metal- no tear off of the old material needed. 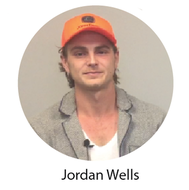 Ability to flex with the thermal properties of the building during weather changes. Seals all punctures and tears of current roofing membrane. Basically, restores a roofs main purpose- protection. Can be made slip resistant (textured), and many colors are available. Resists chemical vapors from industrial exhaust venting or acid rain.